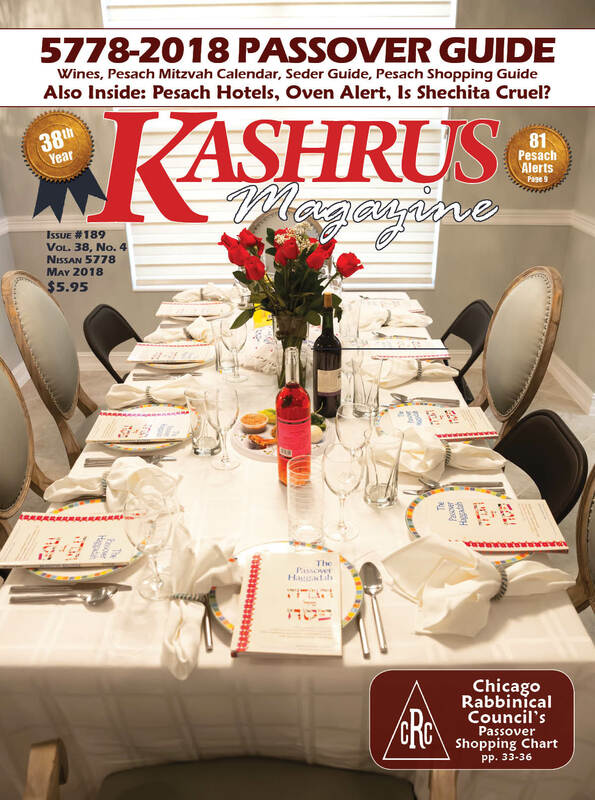 Plus: Pesach Hotels, Oven Alert, Is Shechita Cruel? The Sabbath Mode feature on appliances has been the subject of much debate. Whether and how it can help a Shomer Shabbos warm foods on Shabbos and Yom Tov has been debated for years and was discussed in KASHRUS several years ago. The focus of this article is just public awareness of the limitation of some Sabbath Modes to protect consumers from obvious chilul Shabbos by turning on the light even when the Sabbath Mode is operating. I didn’t understand why that should be, but the caller continued. I commented that that didn’t sound so bad, not the removing the bulb idea but the part of pushing a button to keep the light on; that was surely doable. To add insult to injury, GE refuses to refund the purchaser's money. I started thinking and did a bit of research and here is what I learned. It is true that the GE company, makers of the model JGB700, a gas 30 inch freestanding range, does not claim that the Sabbath Mode disengages the light for Shabbos, but our caller had no idea when they purchased it. He bought their oven from a frum salesman at an appliance company. Being as he had owned Sabbath Mode ovens before, therefore he never read the instructions. Our caller is not alone. I found a serious number of people who have been “surprised” to learn that their GE oven has a light that will turn on when the oven door was opened even in Sabbath Mode. One woman left the oven light on all Shabbos to eliminate turning it on. It burnt out and she decided not to replace it so she would no longer have to worry about it. The expectation of most people is that a Sabbath Mode, at a minimum takes care of these two needs of the owner: it will not allow the machine to shut off all Shabbos (i.e., it will bypass the machine’s normal shutoff time) and it will disengage the light and fan, etc., allowing one to open and close the oven during Shabbos. In 2018, many people turn to Wikipedia, an online “encyclopedia,” the Encyclopedia Britannica of our age. Here is some of what they have to say. “Sabbath Mode, also known as Shabbat (Shabbos) Mode, is a feature in many modern home appliances, including ovens and refrigerators, which is intended to allow the appliances to be used (subject to various constraints) by Shabbat-observant Jews on the Shabbat and Jewish holidays. The mode usually overrides the usual, everyday operation of the electrical appliance and makes the operation of the appliance comply with the rules of halacha (Jewish law). Okay, Wikipedia is not Jewish although whoever wrote that piece obviously was. Here is a quote from a major Jewish organization’s website, one which is very active in kashrus. See how they present the topic. So, it is the primary feature of the Sabbath mode to override the lights, GE doesn’t do it (on select models), and it is no one’s fault but the consumer that he/she did not read the manual before he/she buys the appliance. Now I get it. This must stop. GE has a Sabbath Mode on other appliances it manufactures which turns off the light. It is time to get standardized. In 2012, Dr. Robert Harris, a Shomer Shabbos neonatologist in West Hartford, CT, challenged GE on their “Sabbath Mode” oven. It was not the oven he thought that he was getting, nor is it one that he wanted. Dr. Harris felt betrayed by General Electric for telling him the oven's Sabbath mode complied with the needs of Jews observing Shabbos. Dr. Harris tried to make his point to General Electric, but he could not find anyone knowledgeable about the Sabbath mode. Finally, GE sent a technician to Dr. Harris’ home. As long as GE’s Sabbath Mode is not more unified, especially in its primary functions, and Shomer Shabbos Jews continue to be confused, we don’t agree that GE is doing its job. Do you? Let GE hear from you. You can reach them at 1-877-207-0923, 1-800-626-2005, GE Appliances Consumer Relations, PO Box 1780, Rapid City, SD 57709. If GE changes this “Partial” Sabbath Mode to a real one, you will have prevented much chilul Shabbos. We will continue to eat kosher despite what the world will claim about shechita. But, bottom line, is it cruel? Are we, out of necessity, mistreating the animals and fowl during the shechita process? The famous Hebrew essayist, Achad Ha’am (Asher Zvi Hirsch Ginsberg), once wrote an essay entitled, “Chatzi Nechama” (Partial Comfort). He retold the horrid claims being made all over the world that Jews killed Christians to use their blood. He offered his readers the ‘partial consolation’ that never ever was even one of the libelous claims true. It never happened, never. Our holy service of shechita has been maligned daily in countries across Europe, most recently in England. We should take consolation that it is all fake news, without one ounce of truth in it. Veterinarians, animal welfare groups, political radicalists, and groups that are anti-Jew and anti-Moslem have banded together to apply pressure on the government to directly or indirectly ban kosher and halal slaughter despite our religious rights. There is no nice way of killing an animal for food, but shechita is performed in the best possible way to minimize pain to the animal. In addition, our laws of tzaar baalei chaim control our handling of animals and birds before they are slaughtered, which makes us far more caring than those who do secular slaughter of animals. Here are a few examples of the difference. In Europe today, it is acceptable policy to slaughter meat for the secular community by that which is called “controlled-atmosphere killing” (CAK) which takes up to 15 minutes to suffocate animals, and 9 minutes for chickens, and that barbaric method of slaughter is classed as humane and approved by the RSPCA/BVA, those who are so bent on outlawing shechita. Compare that to the 15 seconds it takes for lamb and sheep to die after shechita. Why do they do that to so many baby male chicks? Egg farmers don’t sell their chicks to be raised for meat, because in industrial agriculture, the breeds of chickens raised for meat (“broilers”) and for egg production (“egg layers”) are totally different. Egg layers are bred to be egg-laying machines who can pump out hundreds of eggs each year. Broilers are bred to be grotesquely large, growing to a huge size within one month. The male of the egg laying breed is too small to be profitable to raise for meat and unable to lay eggs, so out they go. What will take place in 2020 is that the eggs will be examined to see if it is a male or female, and the male eggs will be sold as eggs. So, next time you read an article in a secular paper describing the non-stun slaughter of kosher as inhumane and cruel, realize that it is just Fake News.